Advertising Arts magazine from September 1933 celebrating Charles Coiner's National Recovery Administration logo. Huey Long, the populist governor of Louisiana, purportedly said that if fascism comes to America it will be draped in the American flag and called Americanism. Unlike the rise of Italian Fascism and German National Socialism, what is described as American Fascism was not a “revolution” marked in its initial stages by paramilitary-led street violence. Despite the emergence in the 1930s of the “Fascist Shirts” (referring to the black- and brown-shirt rowdies in Italy and Germany and the Silver Shirts and White Hooded KKK in the U.S.), American Fascism was led by men in suits passing tough regulatory laws rather than wielding head-cracking leaden bludgeons. 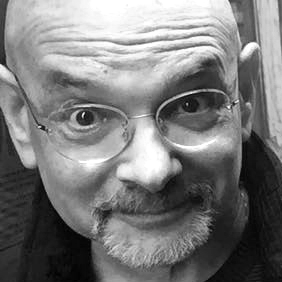 According to cultural historian Wolfgang Schivelbusch in his revealing book Three New Deals: Reflections on Roosevelt’s America, Mussolini’s Italy, and Hitler’s Germany, 1933 – 1939, the hero of American Liberalism, President Franklin Delano Roosevelt, actually had more in common with Europe’s Fascist leaders than not. Fascism was not a dirty word or deed at the outset. Propaganda for FDR’s program was relentless. The government bombarded Americans with demands to join the NRA and ostracized those who refused to participate. 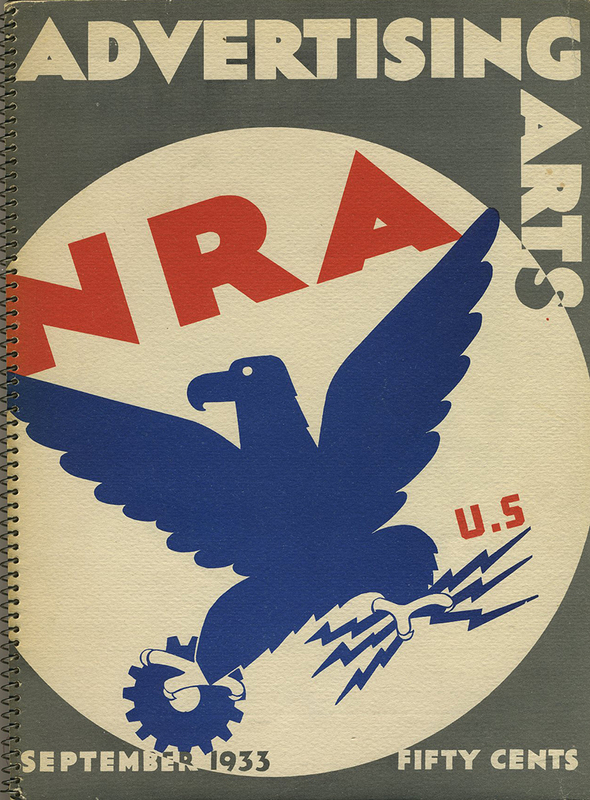 In what Schivelbusch called a “war of symbols” the NRA logo, the “Blue Eagle”, presumably sketched by Hugh S. Johnson, NRA Director, and designed by AIGA Medalist Charles Coiner (who was celebrated for his design in Advertising Arts magazine), a blue spread winged eagle holding lightning bolts in one claw and a gear in another, echoed the Fascist and National Socialist symbols of the era. It was conspicuously used in the United States by businesses to show compliance with the NRA whose modus operandi the Supreme Court later declared unconstitutional. Its motto “We Do Our Part” sounds innocent enough, but Schivelbusch argues it was code for businesses to avoid being targets of sanctioned boycotts (code because it was illegal for the government to order a boycott). Graphic design was integral to these social-political interventions. 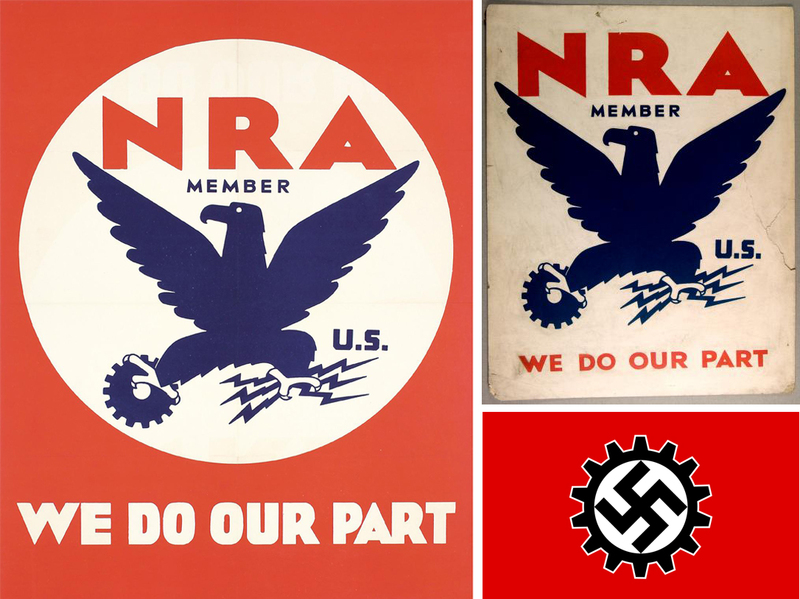 The NRA, Fascist, and Nazi brands, while visually distinct, nonetheless had both strategic and aesthetic similarities. They served the same purpose too: engage citizens and exclude the opposition. Displaying signs and flags or wearing badges and buttons meant one was either for or against. Nonetheless, in the U.S. dissent was tolerated to a point, in Germany and Italy heaven help you. But the underlying message was conformity, or else.